China Geography - HISTORY'S HISTORIESYou are history. We are the future. 1. Geography: ﻿Why do ﻿people ﻿move and live where they ﻿do? Geography is the study of how humans interact with their environment. Like Mesopotamia and India, China developed because two great rivers brought water to the early settlers and silt to the land, making farming possible. Because the area around the Yangtze and the Huang He rivers, was suitable for farming, cities eventually developed along their banks. What effect did natural barriers have on China's development? Located on the eastern side of Asia, China lies about the same distance north of the equator as the United States. China's lands are bordered on the east by the Yellow Sea, the China Sea, and the Pacific Ocean. Deserts edge the northern and western lands. To the north is the Gobi Desert, and to the west lies the Taklamakan Desert. The Pamir, the Tian Shan, and the Himalayan mountain ranges form a tight curve on China's western border. Because of those natural barriers, China remained isolated from much of the ancient world for thousands of years. Unlike ancient India where people benefited from the exchange of goods and ideas with other civilizations such as Mesopotamia, due to its geographic isolation, China developed along very distinct lines. In fact, it wasn’t until around 200 BCE that China became aware of any of the civilizations around the Mediterranean, like the ancient Romans and the ancient Greeks. Except for the barbarian Mongol tribes to the north, for thousands of years the ancient Chinese thought that they were pretty much alone on the planet. In fact, the ancient Chinese were so isolated they referred to their own land as "middle earth." Where is China? Asia is the largest continent on earth. China is the second largest country on that continent, so large that fourteen other nations share its border. China is also the most populated country in the world with nearly 1.5 billion people calling it home. The third longest river in the world, the Yangtze, and the second largest desert in the world, the Taklamakan lay within its borders. The Himalayan mountain range on the border China shares with Nepal is home to the ten highest peaks in the world. Dangerous Deserts: The Taklamakan Desert, pictured below at left, is called the Sea of Death, a sea from which no one escapes. The Taklamakan is the second largest desert in the world. It offers the Taklamakan traveler poisonous snakes, frequent sandstorms, boiling days, freezing nights, and intense water shortages. A very brave explorer did cross this desert on foot relatively recently. In 1998, Carla Perrotti, a 51-year-old Italian woman, crossed the Taklamakan. She walked over 200 miles in 24 days, and she did it by herself. The Gobi Desert, above at left, in China's north is one of the driest deserts in the world. Compared to the horrors of the Taklamakan Desert, however, the Gobi is a paradise. Although water (an oasis) is very rare in the Gobi, there is at least the hope of water. Numerous Mountains: China has some of the highest mountain ranges in the world. The Himalayas, pictured at right, are one of the mountain ranges in China. These rugged mountains are home to the ten highest mountain peaks in the world. Mount Everest is the highest mountain in the world. It is actually in Tibet, not in China, and is located close to the border between those two countries. Vast Seas: To the east, China's border touches the China Sea and, above the China Sea, the Yellow Sea. Both Seas are considered part of the Pacific Ocean. 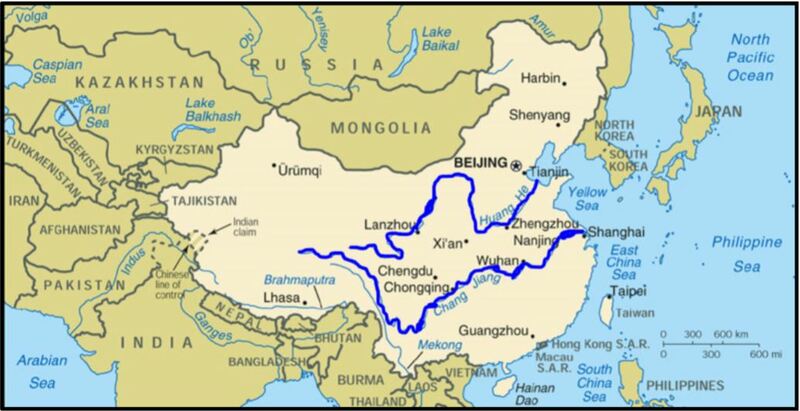 Why were China's rivers called "the great sorrow"? Two Major River Systems: “The Great Sorrow” During the flood season all the towns along China's great rivers could be destroyed. Because of that, all of the rivers of ancient China were called "The Great Sorrow." Each year that towns were destroyed, the ancient Chinese rebuilt. The Huang He (Yellow River) is around 3000 miles long, about the distance from New York to California. The river ends at the Yellow Sea. Because the soil along the banks of the Huang He is fertile, civilization in ancient China began along this river . The Yangtze (Long River) is the third longest river in the world. It’s nearly 4000 miles long. It also ends at the Yellow Sea. At its lowest, the Yangtze is about 25 feet deep. When the snow melts, however, the Yangtze can grow to be 160 feet deep. The river flows through some of China’s best farmland. Because of annual flooding, people have always tried to build their homes and towns high above the river.